This amazon belongs to the parrot family. It is a stocky bird with green plumage scaly yellow on the ventral parts. The area around the eyes is yellow and pale blue front. The shoulders are red and the wing mirrors at the base of the first five secondaries. The primary feathers are blue violet. 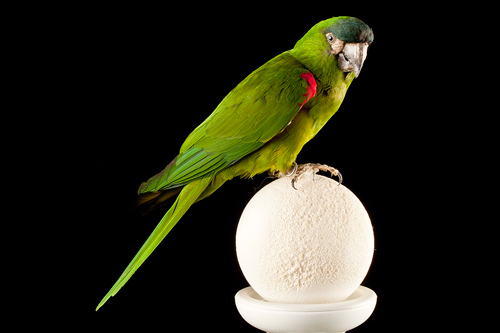 The tail is yellow shaded green. The eyes are surrounded by clear skin with dark orange iris circled. This bird has a robust dark gray beak (almost black), like wax and legs. The young look like the adults but the blue and yellow facial color is almost absent or very subtle and the iris is brown. Young people are getting their final colors at sexual maturity around the age of 3 to 4. Its natural habitat is in South America: Brazil, Paraguay, Bolivia and Argentina. It feeds on seeds, nuts and berries. Breeding begins in late March early May. The male becomes very nervous and can be very aggressive to its healer. The female lays 3 to 5 eggs which are incubated by her for 25-26 days. The male feeds the female to the nest. When youngs are born, male involve in feeding. The youngs are weaned at the age of 3 months. In captivity, they require a large investment of time each day, 3 hours of output is minimal. Cohabitation with other species is impossible, it always ends with the death of the weakest. The species is very noisy in the morning at sunrise and in the evening before sunset. Excellent mimic, they need to be stimulated by various activities to prevent boredom and associated problems. It is not difficult for them to learn a few tricks, and the Amazons, unlike other more timid species love grandstanding. These parrots are very confident, playful and active, they are curious and rather easy to tame. Their education may give a hard time because the Amazons are often called stubborn and temperamental, but their greed will lose! It is not possible to leave your Amazon released without supervision, they like to destroy your furniture and will be part of its favorite snack tooth! Before adopting such an animal, it is essential to learn a lot, to be sure that their temperament matches our expectations, we must know that these birds can live very long. A spacious cage, lots of toys, accessories, several hours of daily output, a stimulating environment, a varied, balanced diet, regular showers, sensitive education and a master who will devote its time is essential to have a breakout parrot in captivity . It can live up to 40 years and 80 years in captivity.